Catch and release is allowed. Barbless or debarbed hooks must be used. It is against our rules to return a fish that is unlikely to recover (i.e. is not vigorous and breathing). The ruling is that catch limits can be exceeded where fish are not deemed fit to be returned. Extra fish must be recorded in our catch return sheet. 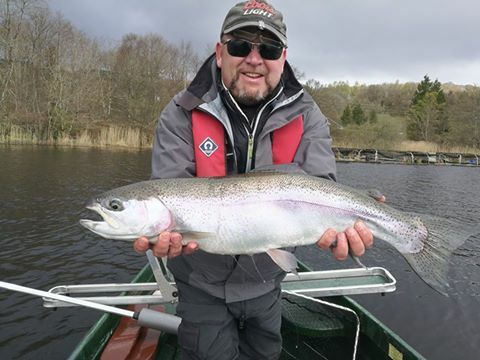 Above 20C water temperature, in the interests of trout welfare, we ask anglers to limit catch and release, as the Lake becomes deficient in oxygen at depth and in the surface layers – this can prevent fish recovery after catching. Releasing of fish should be done in the net in the water without a lengthy playtime. If in doubt speak to management about your plans. All fish under 11 inches to be returned. Fly fishing only. Only landing nets, unhooking mats, drogues and fish bags provided by fishery allowed in boats. No trawling, hand lining or bait. No anchoring or mooring. Maximum of three persons per boat, all of whom may fish. The Health and Safety Executive requires that buoyancy aids or life jackets provided must be worn. To prevent slippage of boat seats (as shown to be possible in this photo, all boat seats must be strapped in place; at least one strap is required preferably at the front). Straps available from the shop, ask boatmen for assistance). Landing on islands is forbidden. No interfering with nets or fixed equipment. For Fly pike fishing proper pike gear is required (hire/loan available, including debarbed single hooks (max size 6), unhooking pliers, mats and nets. All pike to be returned unharmed. Complete pike rules will shortly be published.